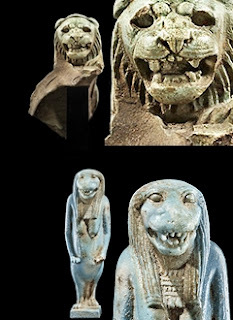 Faience lion and Taweret, goddess of fertility. What is an amulet? It is a small token or talisman, a precious and portable expression of devotion and the hope for protection from disease, death, infertility, or a myriad of other calamities. "In ancient Egypt, such apotropaic [protective] devices could be fashioned from regular materials — such as stone, ivory, metal, glass, and clay — or faience," explains Samuel Merrin, owner of an antiquities gallery on Fifth Avenue. Faience is a moldable, self-glazing glassy frit — a baked material composed of quartz, lime, copper, and an alkali. When it was first developed during the late Predynastic Period (ca. 3000 BC), faience was invariably blue-green in color. Later, other colors were achieved. But the original tonalities imbued the material with magical significance, making it much more precious than it's combined components. Egyptians believed that the color blue-green connoted vitality and eternal life. ibises and baboons with Thoth — the god of creativity, and so on. Alternatively, Samuel Merrin adds, "amulets could also depict a deity in full corporeal form or in part. The wadjet-eye is a common amulet that represents the eye of Horus and offers protection from travails in the afterlife." Some amulets represent the very thing they are to defend against. For example, a snake head would defend against snake bites. Perhaps the most well-known Egyptian amulet type is the eponymous scarab representing the scarab beetle. Because the dung beetle (family: Scarabaeoidae) arises in the morning and pushes a pile of dung (upon which it feeds) into a ball, it became associated with the reappearance of the rising sun each morning and its daily transit across the sky. Thus, Samuel Merrin explains, "the scarab came to be associated with the god Khepri, whose job it was to retrieve the sun from its nightly sojourn in the underworld and to carry it across the heavens." Just as the promise of sunrise each day represents a renewal of the daily cycle, the scarab was thought to embody the promise of resurrection and eternal life.